Photos and Blogs and Tags! Oh My! It's been a long time coming, but we couldn't be more thrilled about the newest set of features for Humzoo. Some of these features have been concepts and dreams since day one of Humzoo, they just took a while longer to design and build them the way we imagined. We can't wait to share them with you. 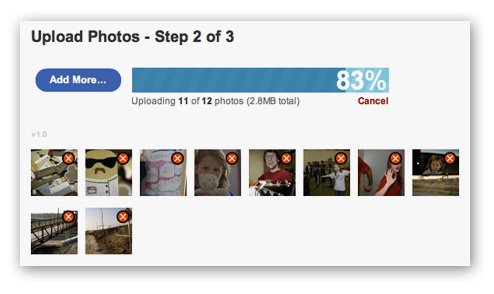 The #1 requested feature, since the early days of Humzoo, has been a way to upload multiple photos at once. Now you can upload an entire photo album in just 3 easy steps. We've come up with a design that will allow you to upload photos and add captions & tags in a fraction of the time it has taken in the past. Another great advantage of the multi-photo loader is the ability to add captions and tags to new photos added to an existing album before anyone sees them. This is a Humdinger-only feature, so upgrade today to take advantage of the new Multi-Photo Loader and upload your photos in no time! Another popular request has been the ability to save blogs in a draft-form for preview and future editing. Starting today that is possible, and we've taken it a step further: unpublished blogs are automatically saved every 3 minutes in the background as you type. Take a break and come back to the blog when the mood hits, or preview it to make sure it looks and feels the way you intend. This feature is available for all Humzoo members today. We've completely redesigned the tagging system, making it easier and more fun to add tags to content on Humzoo. The old checkbox system is gone. 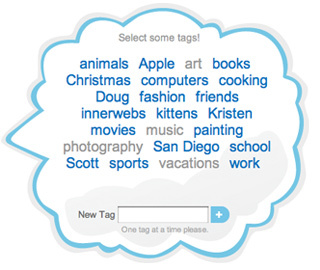 Everyone now will see a Tag Cloud to quickly manage tags. This new feature makes adding tags with the Multi-Photo Loader a breeze. Plus, you can drag the cloud around the page, just for fun. We really hope you like it. We can't thank everyone enough for the awesome support we've had along the way! Many of you have asked for these features, and we're so glad we have finally delivered them. Thank you for your patience. We're very excited to see what everyone thinks of the new features. Once you've had a chance to check them out come back to this blog and let us know what you think! Woot! Love 'em all! Thank you!! This totally rocks!!! Thanks for working so hard to give us amazing upgrades!! So excited!!! Love Love Love you guys!!!! I just uploaded 8 pics, comments and tags with it; using one hand (the other is feeding Charlotte) in about 4 minutes! Thanks guys!!!! Can't wait to try the new features. K8 said it all. Now, I need to go take enough photos to try the multi-photo upload! Wow...glad I'm a Humdinger for that one! :) And the other two features sound great too--I've experienced the blog issue and learned to do most of them in a document form first. This is AWESOME. And being able to edit before publishing--even nicer! And that cloud!! Can't wait to try that. A floating cloud! Not even something I thought I needed but it sounds great. Thanks for all your hard work on all these projects! We love you guys!! awesome! thanks for your hard work. Finally, I'll get those Halloween pics up! WOW! That is so much faster. Thanks again! freakin awesome... i love saying freakin! I had a couple of odd things. First the cloud got stuck and wouldn't STOP moving around. I finally figured out if I double-clicked on it it would stop. That took a few crazy attempts at trying to grab a tag on a fast flying cloud! I've been having the same problem as LGrant with the tag cloud. I'll have to try her solution. I really enjoy the related content. Nice addition. The double-click on the cloud definitely fixes the problem. I'm still not sure about the larger image available thing. Sometimes it opens Preview and sometimes it doesn't. I'm not sure why it wants to download a photo just to show the larger image now. Maybe I accidentally reset something on the Mac.